Material: This artificial ivy is made from Top Quality and Soft Realistic Face-Resistant Polyester. 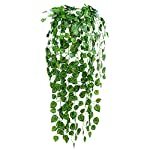 This fabulous artificial ivy have emulated the veins of the leaves that looks quite wonderfully realistic and lifelike. Remain green color throughout the year that helps to add to the realism. Beautiful Privacy:You can hang on the wall,doors,swing,mirrors and anywhere as you like to enjoy with our artificial hanging ivy garland. The fake foliage ivy help to provide extra privacy on your balcony or backyard to feel a little bit more like home. Material:Leaves were produced from silk and the stems were produced from plastic, top quality. Length:each strand 6.9ft long,12pack total 83ft long,80 leaves per strand. Suitable for bookshelf, wardrobe, shelves, shelf, air conditioning, refrigerator, and so forth. Can be used for indoor and out of doors decoration, celebrations festive supplies, wedding supplies. Make your house full of natural feeling. Artificial ivy spreads cheer in your bedroom, living rooms, fences, enclosures, stairs, hallway. Fake foliage lend a hand to supply that extra privacy whilst you might be out of doors sun gazing or relaxing for your own backyard. This ivy garland will never die off, and easy maintain it. in order that it may be a nice decoration for a very long time. 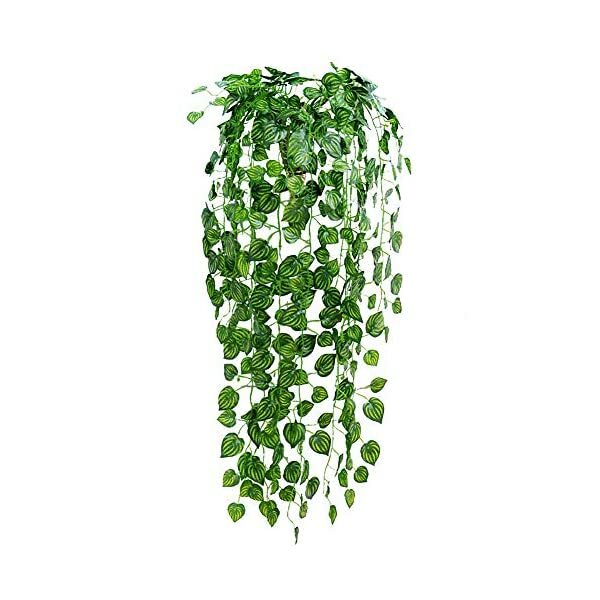 DO NOT HESITATE, now add this ivy vine to cart, and bring new life to your house and garden. Note: If any problem, please feel free to contact with us. Material: This artificial ivy is produced from Top Quality and Soft Realistic Face-Resistant Polyester. This fabulous artificial ivy have emulated the veins of the leaves that looks rather wonderfully realistic and lifelike. Remain green color during the year that helps so as to add to the realism. Beautiful Privacy:You’ll hang at the wall,doors,swing,mirrors and anywhere as you like to enjoy with our artificial hanging ivy garland. The fake foliage ivy lend a hand to supply extra privacy in your balcony or backyard to feel a bit bit more like home. 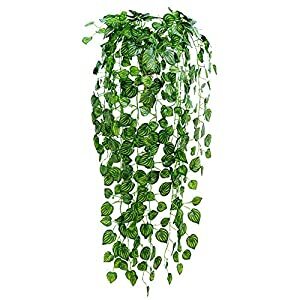 Provide Coziness: These artificial ivy leaves are foliage green, looks very natural and vivid which can create a Natural and Calming Environment. The fake ivy vine are lush, abundant and overflowing. Detailed with lifelike leaves will makes our balcony cozy, and fortify the look of the fireplace for the spring and summer months. Wide Range Of Usage: The artificial greenery can be utilized indoors and outdoors. Perfect for building a living wall, privacy fence or disguising areas such as air condition, stained walls, or chain link fence.Also can be utilized for special events such as weddings, reception party, festival, garden and stage decoration.